The numbers, meanwhile, reflect this perception. Over the last month, investors have poured a net (inflows minus outflows) $2.1 Billion into EU capital markets, an impressive sum when you consider that the figures for Japan and the US were both negative. Meanwhile, stock markets in the region are up by 50%+ since bottoming last March. When you account for currency fluctuations (i.e. 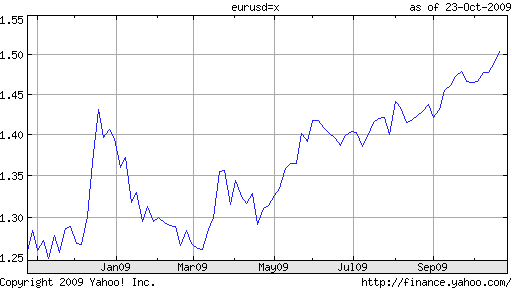 Euro appreciation), stock market comparisons between the US and EU start to look pretty lopsided. At this point, you’re probably wondering, “Why the long preamble on European stocks?” Because, it’s easy to forget that there are inherently two sides to every currency pair. In the case of the USD/EUR (the most frequently traded pair in the world), most of the recent commentary has focused exclusively on Dollar-negatives, portraying the dynamic as a depreciation in the Dollar. In this context, it’s easy to forget that the Dollar’s depreciation implies an appreciation in the Euro. Duh?! But seriously, for every Dollar bear, it seems there is at least one Euro bull. To be fair, those who don’t see much to be excited about in the Euro can be forgiven. After all, the European economy is technically still mired in recession, and isn’t projected to return to growth until 2011. While some of the intangible indicators are improving, others continue to stagnate. “Industrial output in the euro zone is 20% lower than its February 2008 peak, despite some recent improvements.” In addition, the appreciation in the Euro threatens to choke off exports and stifle the recovery before it has a chance to get off the ground. Very interesting, how strong is the link between the stock market prices and the weak US dollar. The Eurozone’s money supply went down again. The indicator is falling since January this year. I´ve been looking the news at my platform (broker ACM gives them) and in the markets I don’t see big changes.